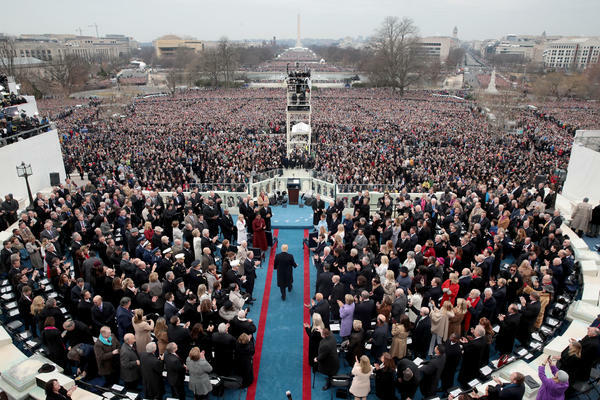 More than a year after President Trump was sworn in, his inaugural committee said in tax filings that it raised nearly $107 million and spent almost all of the money. The Trump committee raised $106.8 million, roughly twice as much as President Barack Obama's 2009 committee. Insiders suggested substantial gifts to charity with the unspent funds. Thomas Barrack, a Trump ally and president of the inaugural committee, told the Daily Beast last fall that the IRS filing "will show that millions of dollars of reserve funds will be allocated to various charities, institutions, and foundations in an amount that will surely exceed any previous inauguration." The filing doesn't exactly show that. The committee gave $1 million each to the American Red Cross, Salvation Army and Samaritan's Purse in 2017. The filing shows three more contributions: $1 million to the White House Historical Association, $750,000 to the Vice President's Residence Foundation and $250,000 to the Smithsonian Institution. Total contributions: $5 million. That leaves about $2.7 million in the committee's accounts. After final expenses are paid, Barrack said, remaining funds will go to "charities of similar stature and quality." Unlike campaign committees, inaugural committees are not required to give a detailed accounting of where their money goes. One spending item drew immediate attention from watchdog groups. WIS Media Partners, a firm incorporated shortly after Trump was elected, was paid $25.8 million — more than any other vendor — for "event production services." The New York Times reported WIS was created by Stephanie Winston Wolkoff, a friend of first lady Melania Trump, and Wolkoff herself was paid $1.62 million for her inaugural work. Wolkoff is also an unpaid adviser to the first lady. "Mrs. Trump had no involvement with the [presidential inauguration committee], and had no knowledge of how funds were spent," said Melania Trump's spokeswoman, Stephanie Grisham. "Stephanie Winston Wolkoff is a contracted volunteer with the Office of the First Lady and has specified duties as outlined in her contract." Public Citizen, a liberal watchdog group, and the lawyers' group Campaign Legal Center both pounced on the filing as proof that inaugural committees need better disclosure. Craig Holman of Public Citizen said the filing showed fiscal mismanagement, adding that it's "no wonder" the inaugural committee didn't make voluntary disclosures. A representative of Barrack didn't respond to requests for comment.